Green Chilly: 5 (cut lengthwise) the number varies depending on how hot the chilly is. Cut the Pumpkin rectangular shape 2inchs. 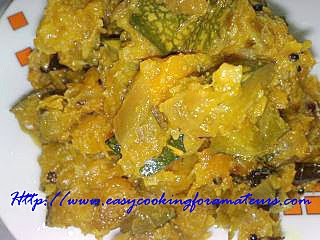 Put mustard seeds, curry leaves & add onion, 1/4tsp salt (adding salt makes onion to cook fast) stir it then add green chilly. Stir it till onion turns little brown. Add pumpkin & salt mix well ,close the lid no need to add water as pumpkin itself leaves the water. Stir in between till water evaporates (add salt if needed) & at-last add grated coconut/desiccated coconut . Sever this with Rice Roti/Akki Roti & Chapati.